This soap is made of a combination of organic extra virgin coconut, olive, jojoba and hemp oils, together with pure essential oils. Available in bar or liquid form, it cleans effectively without being aggressive and produces a velvety-lather that leaves the skin silky-smooth and refreshed. My favorite scent is peppermint, but there is a variety to suit all tastes: lavender, citrus, tea tree, almond, rose, and eucalyptus. All versions are biodegradable and vegetable-based, which means lake bathing in the summer months (a favorite pastime of mine!). They are packaged in 100% post-consumer recycled (PCR) cylinder bottles and paper labels and best of all, they contain no synthetic foaming agents, thickeners or preservatives! One of the most objectionable things you’re trying to avoid when buying drug-store soap is called sodium lauryl sulfate, or SLS. This inexpensive detergent is commonly used in cosmetic cleansers, hair shampoos, bath and shower gels, bubble baths, etc. It is probably the most dangerous ingredient used in skin and hair-care products. In the cleaning industry SLS is used in garage floor cleaners, engine degreasers, car-wash soaps, etc. It is very corrosive and readily attacks greasy surfaces. A study at the University of Georgia Medical College indicated that SLS penetrated into the eyes as well as brain, heart, liver, etc., and showed long-term retention in the tissues. The study also indicated that SLS penetrated young children’s eyes and prevented them from developing properly and caused cataracts to develop in adults. SLS cleans by corrosion. It dries the skin by stripping the protective lipids from the surface so it can’t effectively regulate moisture. Another extremely serious problem is the connection of SLS with nitrate contamination. SLS reacts with many types of ingredients used in skin products and forms nitrosamines (nitrates). Nitrates are potential cancer-causing carcinogens. Because of the alarming penetrating power of SLS, large amounts of these known carcinogens are absorbed through the skin into the body. A variation of SLS is SODIUM LAURETH SULFATE (Sodium Lauryl Ether Sulfate- SLES). It exhibits many of the same characteristics and is a higher-foaming variation of SLS. Look for SLS in these products and find alternatives! Do not believe that just because a product is labeled as “natural” it is free from SLS or sodium laureth sulfate. Most common brands of “Natural” or “Herbal” shampoos and cleansers still use these harmful chemicals as their main active ingredient – check your labels. I’d also like to share this video about Dr. Bronner’s Magic Soap company’s recent effort to get all of the olive oil they use in their soaps from organic & fair trade sources. Hey Sarah! I was wondering what was the mascara you put in the goodies bag at your retreats, cant remember the brand! Fantastic Blog! Can I subscribe to receive emails! 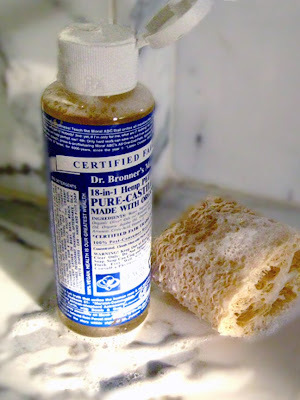 i am from canada, and also love dr. bronners, but i am now living in france and cannot find it here. have you been able to find it here in europe or do you order it online?